I’ve spent many years focusing on delivering applications and desktops to users with Citrix Virtual Apps and Desktops (XenApp & XenDesktop). I, like many of you, started with on-premises deployments and am witnessing a growing shift towards cloud deployments. Regardless of the reason and justification for a move to the cloud, those of us focusing on the technical aspects of such a decision need to understand how the pieces fit together. 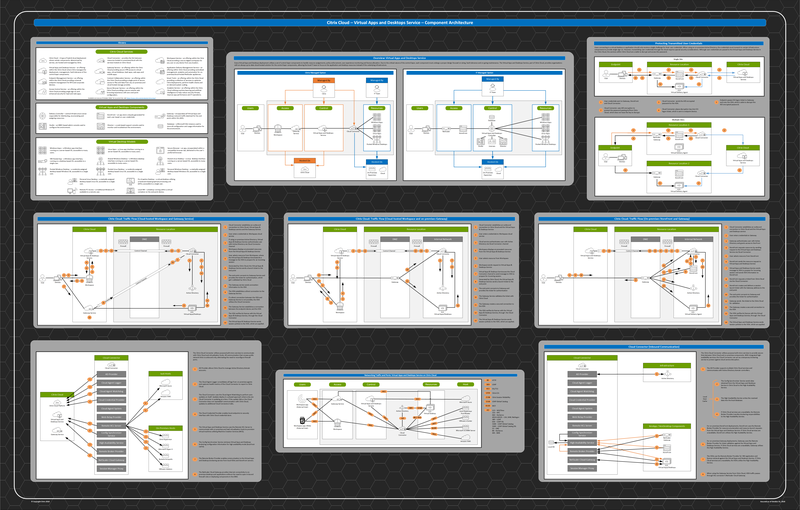 In fact, these questions are very similar to the ones I often hear for on-premises deployments, which was the basis for the Citrix Virtual Apps and Desktops – Architecture Poster. And for those of you who want the original diagrams, I’ve added them into the latest revision of the Citrix Visio Stencils. Finally, I’d like to give a huge shout out and thank you to Joel Stocker who helped me create these diagrams. Updated Networking Traffic and Ports diagram. Amazing diagram Daniel! Thanks a lot for creating and sharing this! I cannot read the letters on screen or when I print it. Is an xps file better for this kind of detail? Or jpg? Very useful diagram. Thank you very much. Can you please also provide a diagram for network traffic flow for Citrix cloud – on premises NetScaler gateway and storefront? Specifically I want to know what is the network flow for the ICA/HDX? Great diagrams! Thanks for all the hard work.